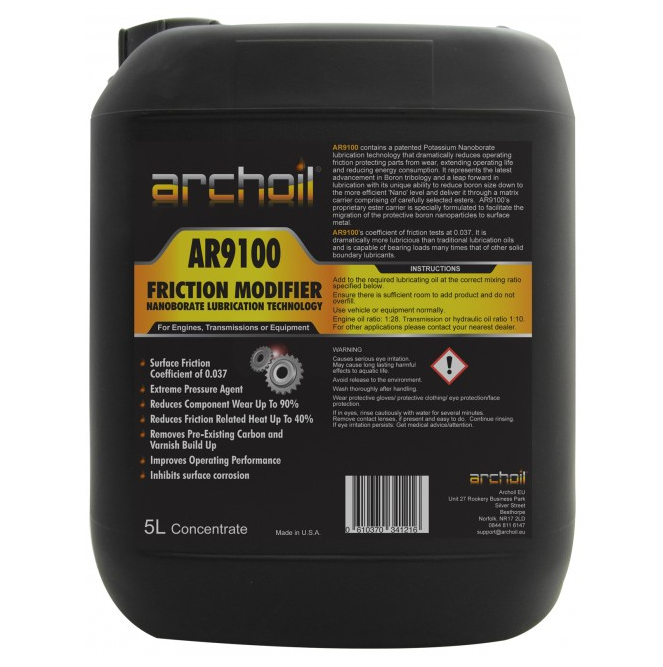 Archoil AR9100 Friction Modifier in short. AR9100 is based on Archoil’s patented Potassium Nanoborate lubrication technology which dramatically reduces operating friction, protecting equipment from wear, extending operating life, and reducing energy consumption. Archoil AR9100 is based on Archoil’s patented Potassium Nanoborate lubrication technology which dramatically reduces operating friction, protecting equipment from wear, extending operating life, and reducing energy consumption. and protection through the formation of a nearly frictionless solid boundary layer IN metal surfaces. formulation represents the latest generation in boron tribology and another huge leap forward in lubrication with its ability to reduce boron size down to the high efficient nano quantum effect level, and deliver it in a naturally occurring fatty acid ester matrix carrier. AR9100’s proprietary ester carrier is specially formulated to facilitate the migration of the protective boron nanoparticles to surface metal. As AR9100 bonds chemically in the metal through a chelation process it will bring performance for a much longer period of time compared to conventional, mechanically sticking lubricants. 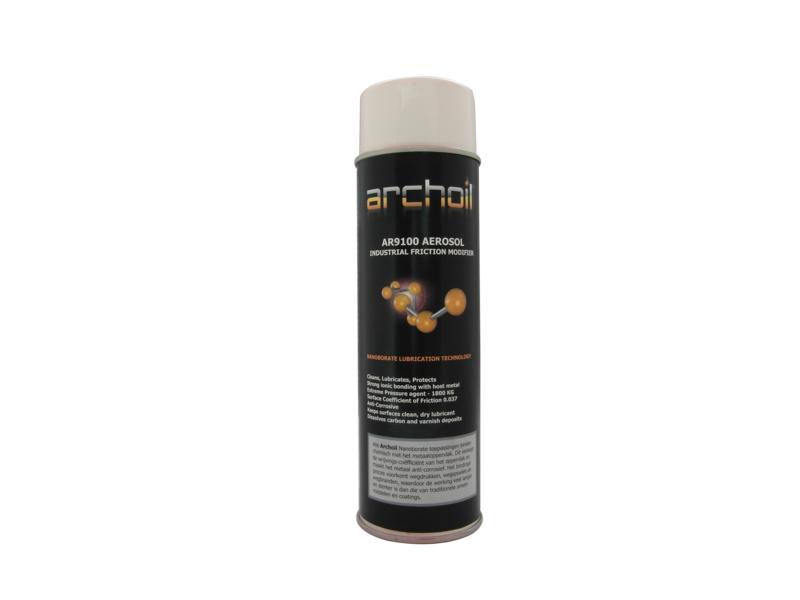 Archoil AR9100 does not build up on metals, it bonds into the metal surface. Using Archoil AR9100 will maintain a high and usable quality of your engine, thruster and gear oil, for main engines as well as auxiliaries. Most additives used in conventional lubricants only start to work from temperatures of 20 °C and higher and drip off metals after 24 hours after machine-stop. The bonded Potassium Nanoborate is always there and works immediately. Because hot-spots in de machinery are benefiting from nanoborate , oxidation of the lubricant and wear of the parts is downplayed to a minimum. AR9100 is suitable for transport by air. Store Archoil AR9100 in dry conditions. Archoil AR9100 can be stored for 2 years. Keep opened packaging firmly closed. Store Archoil AR9100 at temperatures between 5° C and 30° C.
Archoil AR9100 is available in 0,25L, 5L, 20L, 208L or 1000L packagings.